It’s a fair question – and one I get often enough that I really should take the time to explain. If you look around the internet, it may look like holistic nutrition is all about green juice and quinoa and the ten foods you should never EVER eat ever again if you want to be healthy. Does that make you want to run screaming in the other direction? Me too. Don’t get me wrong: I love me some quinoa, but extreme “all-or-nothing” thinking has no place in my definition of health. So what exactly is holistic nutrition? A customer approaches Kelly, who is standing in the supplement section. What do you have for hair loss? What’s causing the hair loss? No, I just want, like, a pill or a cream or something for hair loss. Well, if it’s from stress, you need to look at adrenal health. tying your ponytail too tightly . . . So you don’t have a pill for hair loss? No, no we don’t. Have a nice day. It’s not just about saying, “Help me get rid of my acne!” and having me recommend a brand of organic face wash. It’s about figuring out what’s causing your acne (diet? hormones? zinc deficiency? digestive issues?) and making the right changes to your life to help correct it. That’s the main reason I think the holistic treatment of eating disorders is so important: it wasn’t enough just to eat all the meals and snacks I was supposed to in a day, I had to get to the bottom of what was triggering my eating disorder in the first place. Yes, one must have a genetic predisposition to develop an eating disorder, but I couldn’t fight my genetics. What I could fight were the things within my control. I did the emotional and behavioral work with my therapist, and made incredible strides, but after a while I found myself at an impasse. I was eating, I was weight-restored, but I was still miserable and self-loathing. I needed to look deeper. I began to work on the physical components that were keeping me sick. By working holistically, I was able to correct the deficiencies that affected my mood. I balanced my hormones, and fixed my digestion (which plays a HUGE role in both physical AND mental health). While I still have what I call “a low-grade buzz of depression”, it’s just that – a hum in the background that no longer cripples my life. In healing my body, I was able to heal my mind, and break down the barriers that kept me from doing the work I needed to be fully recovered. Just as I had to dig deep to find the origins of my emotional difficulties, the same was true of my physical and mental ones. So yes, it may be frustrating when you ask me what to do to get over your current cold, and instead of handing you a cure-all supplement I ask you about your work-life balance and *ahem* bathroom habits, but if you only heal the symptoms that appear on the surface, you’ll only ever achieve surface-level healing. Healing, however, doesn’t mean giving up everything you love to subsist on green juice and quinoa forever. It means finding a balance that works for YOU – protecting both your physical health AND your mental health. Yes, I will probably suggest eating some greens in your life, but you will also eat cookies and pizza and foods that make you feel alive, because who wants to live forever if forever doesn’t include ice cream? 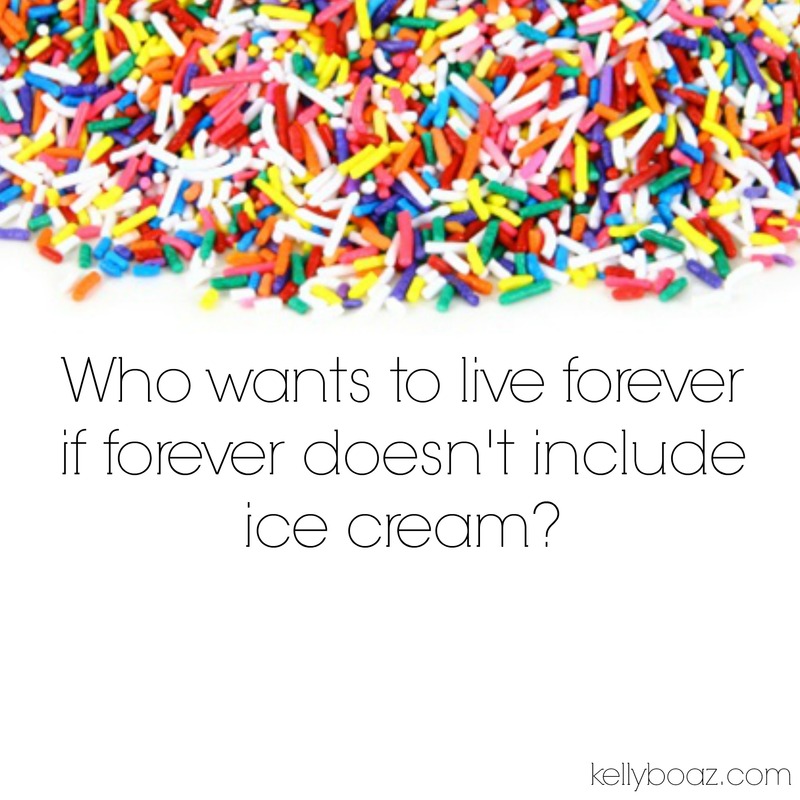 Yes, I’m fully aware that my digestion will be a bit, well, cranky, if I eat said ice cream, and my body will throw a zit-covered temper tantrum, but sometimes living life is worth a few zits.